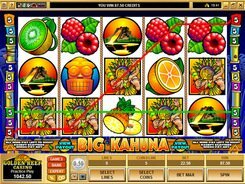 Big Kahuna is a five-reel nine-payline slot packed with bonus features. Its theme is centered on jungles and exotic tribal traditions. 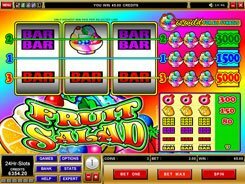 The slot has a range of fruit symbols, as well as the Chief, komodo dragon, monkey, tribal mask and other themed icons. 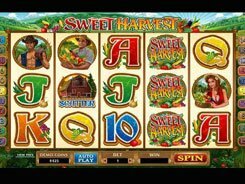 Select the number of paylines before spinning the reels. Then put up to five coins per line and adjust a coin denomination between $0.05 and $0.5. The Big Kahuna logo is a wild symbol that acts as a substitute for other regular symbols (fruit and berries). 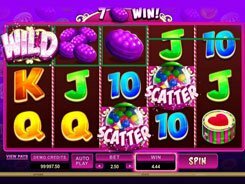 Five wilds appeared on a payline pay out a jackpot win of 8,000 coins. But if you are playing at a max stake, you can grab 40,000 coins for the combination. 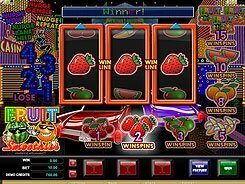 The Monkey is a scatter symbol, with two of them landed in any position multiplying your win x3 times your total bet per spin. Three scatters pay x10 times your bet, four scatters pay x25, and five scatters pay x200. 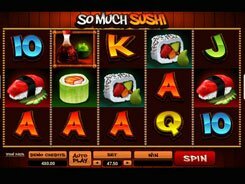 The slot has two bonus games triggered by two bonus symbols. The Pick a Mask Bonus starts if you hit at least three mask symbols on any active payline in consecutive order. In the Bonus game 10 masks are displayed, and your task is to select as many items as possible before you uncover a Collect that completes the bonus game. All wins earned during the bonus feature are automatically added to your balance, once the bonus feature is over. The second bonus is the Volcano Bonus. Here you get to select one of the five fruit offerings to sacrifice to African gods. The fruit offering that you picked is dropped into the volcano. Then, you are awarded a cash prize depending on your selection.